I have to admit, I wasn't expecting much of Novak Djokovic this first half of the year. I know he ended last year on a pretty good note, but coming in this year with a new stick just really baffled me: Why do that when you're coming off a career year? I thought he wouldn't make a decent adjustment until mid-year at least. But picking up Dubai today shows he's getting on track. Granted, this wasn't the field it was expected to be with so many injury withdrawals, supposed injury withdrawals and boycotts, but any title's a good title. He had to do some fighting this week, particularly against Gilles Simon in the semis. I'm sure this could help Djoko going forward confidence-wise with Davis Cup and Indian Wells coming up in the weeks ahead. And congrats, too, to David Ferrer for a nice run to the finals. He's someone, too, that needed a good run in an event. He's one of those guys that definitely have to fight for everything, which can be a grind as far as maintaining success goes. But you can never count him out. And I guess the same can be said for Djoko, too. I like Davis Cup. Why doesn't Roger Federer? First, I'm a little surprised at Federer letting someone in his camp contradict what he said. But maybe Paganini just didn't know any better. More importantly, though, I think this makes it official: Davis Cup doesn't mean much to Roger Federer at all, at least from this Federer and Davis Cup fan's perspective. I don't think he's as apathetic toward it as Jimmy Connors was, but still. Was one weekend going to hurt his chances in Indian Wells? It's not like travel was going to be an issue; he was going to be in the States anyway. Now, I know there's a lot of complaints about Davis Cup: the format's weird, it's too many matches in three days, you might have to travel far away, blah, blah, blah. But what about the thrill of trying to get it done for national pride? Is that too corny a concept? Granted, Federer has a lot of pressure on him as he has some pretty unreliable backup and more than likely has to play three matches. But despite the flakiness of Stanislas Wawrinka and the pure journeyman status of Yves Allegro, I think the team could've still been a contender. And I think they could've been, even without Federer playing doubles. What I would do if I were the Swiss captain would be to have Federer and Wawrinka play singles, then Allegro and Stan or one of the countless scrub Swiss players go at in dubs. You know Federer's going to win both of his rubbers. If you can't get one out three from the other ones, then hey, it's not his fault. I think Davis Cup is on a good run right now. Every team in the World Group appears to be putting their top players out there. And I know there was some controversy in last year's finals with Argentina fighting each other, but my understanding is that it was due to commitment issues. And look at Rafael Nadal: skipping tournaments to play Davis Cup. Sure, Federer's got an Olympic Gold, but he's too great a player not to have a Davis Cup trophy on the mantelpiece. All the legends have at least made it to the final round. Four weekends a year: That's all it would take for him to get his. Those things still count for something, you know. Once a week, I write a little feature for that tennis blog you all know and love, Down the Line!, called VANtage Point. In it, I give my take on a tournament for the week. This time around, I have my eyes on the men's and women's tournament in Acapulco, where players such as David Nalbandian, Tommy Robredo and Venus Williams are going at it. You can catch this week's edition of VANtage Point here. Thanks, and see you here and there! I didn't know he had that boycotting spirit in him! Andy Roddick dropped out of next week's Dubai tournament, where he's the defending champ. Last year, he knocked off Rafael Nadal and Novak Djokovic on his way to taking the title. Roddick said he's skipping the event because of the Shahar Peer incident, which you have to say is quite honorable. I read something, though, with the tournament organizers saying that because he's playing in Memphis this weekend, it would be impossible for him to make it to his first-round match on time. Then they said he has a hernia, which Roddick shot down after winning the title. That sounds like a face-saving, sour-grapes kind of statement to me. I don't think Roddick would be willing to sacrifice big ranking points and big bucks for something like traveling woes. That's part of being a pro: getting on the go when you have to. So I just wanted to acknowledge that in this day and age, it's nice to see a professional athlete taking a stand for something. And I can't help it, but I've had this thought creeping in the back of my head for a few days: If Andy Ram hadn't gotten his visa, do you think the tournament would've still gone on? For some reason, I just perceive the guys on the ATP as being more unified than their female counterparts. I'm assuming the whole Shahar Peer incident was kind of last minute, but I bet if the organizers would've pulled that on Ram, you would've seen a massive boycott. I'm just sayin'. Venus Williams just won a match as close as close can get against her sister Serena Williams in the semifinals of the much-talked-about, much-maligned tournament in Dubai. I guess Dubai is as much a home for as Wimbledon now: It looks like she just can't lose out there after having just won the season-ending championships last year. Over at VANtage Point, I was going with Dinara Safina to come through. So much for that call! Peer has the right to play where she wants, and if it's up to the tournament to be more diligent in regard to security and fan protests, then so be it. The organizers made an agreement with the tour to hold this event: Live up to it and do right by the players. Things are a lot more complicated, of course, and I hope I'm not giving too simplistic a response, I just felt I needed to say something about the issue. As for Roger and Rafa, I have mixed feelings on these two and the tournament. I don't know what's up with Rog; that's going to be a lot of time he's taking off. Hope he gets better. As for Rafa, I'm glad to hear he's saving up for Davis Cup. I wish Federer could've gotten out there as well. I love writing and talking about tennis. As a matter of fact, I love it so much that I'm even writing about it for another blog, too! Everyone knows Down the Line! I'm assuming, probably one of the biggest tennis blogs out there. Well, each Monday, I have a little feature on there called "VANtage Point." I can't take credit for the name—that's blog owner Rich's creation. At the Point, I do a brief spotlight on one of the tournaments for the week, talk about a player I have my eye on and try to predict the winner. This week is the third edition of VANtage Point and I have my eye on Dubai. You can check it out here. After you check out the Point, take a gander at the other stuff on DtL. And please be sure to come back to Tennis Talk, Anyone?! Nothing like a little love from the home crowd to pull you through! Amelie Mauresmo had a great Valentine's Day yesterday, knocking off Jelena Jankovic in the semis in Paris. She goes on to face Elena Dementieva who got through via walkover when Serena Williams couldn't play. • Tommy Robredo won the Brasil Open over against Thomaz Belluci for his first title of the year. Now this is something that kind of intrigued me earlier this year: I read in some interview before the Australian Open that Robredo said he liked his chances going in. Really? With the Big 4 playing there? Come on! But you know what? He gave a great effort there, getting to the round of 16 before falling to Andy Roddick. It's nice to hear a player saying they have just as much a shot as anyone else and fighting to make that happen. • Radek, not Roddick, will be playing for the San Jose title today against Mardy Fish. Stepanek beat A-Rod and Fish beat good buddy James Blake. A Roddick-Blake final was probably the tournament organizer's dream, but Stepanek-Fish shouldn't be bad. • Vera Zvonareva won Pattaya City today, beating Sania Mirza in the final. Two things on this: Zvonareva has to stop playing these smaller events. She pads her resume with these titles, which I don't think help her when she gets to the big tour stops when she has play fellow top-tenners in the later rounds. Then again, I said that when she went into Dubai last year and look what happened! And also, watch out for Mirza. She just won the Aussie mixed and now a runner-up showing at a tournament. Good results in a short stretch. 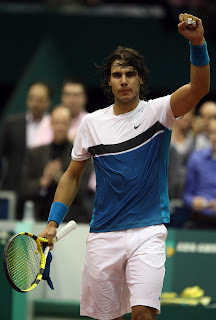 • And don't think I forgot about the main event going down today: Rafael Nadal vs. Andy Murray in Rotterdam. I think Rafa wants to take Murray down a notch in this one. But it's funny: Even if Murray wins, I don't think it's going to count much. Here's what I mean: Murray was supposed to win the Australian, but lost pretty early, while Rafa went on to win. Beating Nadal at Rotterdam would be a decent result, but having not made a strong showing at the Australian was still a setback that he probably won't get to overcome until Wimbledon. You have to get it done at the Slams. As it is, I'm back to thinking Murray is further behind Rafa than he was a few months ago. There's a heavyweight battle set to kick off at the ATP tour stop in Rotterdam between Rafael Nadal and Jo-Wilfried Tsonga for a place in the semis, which Andy Murray and Mario Ancic have already advanced to. Both Nadal and Tsonga have had a pretty good start to the year, to say the least. Rafa's coming off winning the Aussie, while Jo-Willy just won in Jo'burg last weekend. I really couldn't give you a prediction for this match that I'd feel confident in making. I know, I know: I'm usually so fearless with my calls (or crazy! ), but this one's tough. I guess I'd have to go with Tsonga with them being indoors and all. But I also feel Nadal's always going to make adjustments when he's playing someone that's taken it to him before. Either way, it should be a good one. While I'm here, though, (which I really haven't been all week: sorry about that!) I just want to mention something that I was kind of happy to see: both Nadal and Serena Williams playing so soon after winning a Major. Of course, players are welcome to do whatever they want and play when they want. Based on taking the Aussies, both of the number ones have put themselves in a pretty good place to be from a ranking and dominance perspective. But getting out there shows that they're not content to rest and want more, which is what you always want to see as a fan of any sport. And oh, what the heck: I'll go with Tsonga in three. I don't know if I could've lived with myself without making some kind of call! There may be hope for U.S. women's tennis yet! In case you missed it, the U.S. team rallied from 2-1 down to eke out the win against Argentina 3-2 in their quarterfinal matchup. And if you missed this tie, you can't really be blamed because there were no big names to speak of. The highest-ranked player out there this weekend was Argentina's Gisela Dulko at 44. 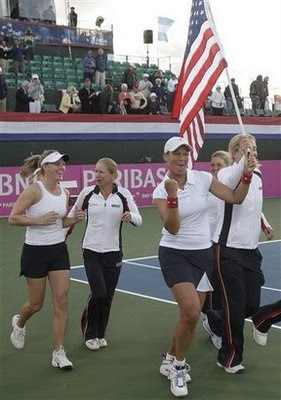 However, a true team effort from Jill Craybas, Melanie Oudin, Julie Ditty and Liezel Huber got them through. A few years ago, when Patrick McEnroe took over the Davis Cup captaincy, he decided not to go the route of begging Andre Agassi or Todd Martin to play every tie, but rather decided to go with a youth movement, which included Andy Roddick and James Blake. And believe it or not, the Bryan brothers practically had to beg to play, even though they were among the best doubles teams in the world. McEnroe didn't want to throw dubs specialists out there in case he needed an extra singles player. I remember him saying something to the effect of, "Well, it's not like the Bryans have won Slams." You can't tell me that didn't light a fire under old Mike and Bob for their careers going forward. I think it worked out good for the Bryan brothers, Blake and Roddick. Oh hey, before I completely move on from the Australian (I know, give it a rest, right?) I just wanted to mention this: The Serbian superstars really had tough tournaments, huh? So tough, in my mind, that questions have to come up about their prospects for the year. I'll take it from the top, or rather the former top-spot holder. Going In: The world number 1 was top seed at a Major for the first time in her career. Her play at the start of the year wasn't exactly much to write home about, but many people thought this was going to be where she justified her ranking. Heading Out: She fell to Marion Bartoli in the fourth round. I know Bartoli had been playing pretty solidly heading into the Aussie, but I think it's still a bad loss, especially for a number 1. My '09 Prognosis: Jankovic is going to stay in the top five because you know no one is going to work harder than her. However, I would have liked her Slam-winning opportunities a lot more this year if she would have had a decent showing at the Australian. Going In: The defending champ's preparation going in was kind of sketchy with a first-round loss to Ernests Gulbis and a semifinal loss to Jarkko Nieminen in his warm-up tournaments. 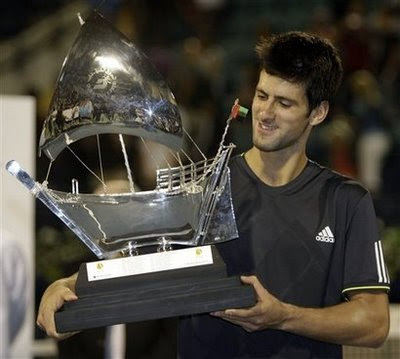 The big news about Djoko, though, was the new racquet he was using. Why, oh why, would he switch after coming off a career year? Heading Out: Djokovic really felt the heat—and the pressure from Andy Roddick—in the quarterfinals. He had to retire after going down a couple of sets. But I don't think you can bash him too much on that: It was pretty hot out there! My '09 Prognosis: I have to tell you, I really like Djokovic's game. He does everything well and can play on all surfaces. But I wonder, is he a better hard-court player than Rafael Nadal, Roger Federer and Andy Murray? Is he a better clay-courter than Nadal or Federer? Better on grass than Nadal, Fed or Murray? In other words, I think he's about the third or fourth best on every surface, and a lot will have to go in his favor to win a Slam this year. Going In: What can you say? Ivanovic's form has been at a pretty low level since the French last year. There really wasn't much to go on counting her as a legit threat this year. Heading Out: Almost true to form, last year's runner-up fell in the third round to Alisa Kleybanova. Who, you might ask? Exactly. My '09 Prognosis: I read this on Tennis Is Served... that former top-10 player Greg Rusedski said in his commentating that he doubts Ivanovic will ever return to the top spot. I'm kind of inclined to agree with him, but then you have to think that she's so young, maybe there's a shot. I definitely don't see it this year. What these young Serbs have done in the game is pretty amazing, and I do wish more success for them. It just seems to me that they're close to a career crossroads, which is a shame because they've brought a lot to the game. Good luck to them continuing that. 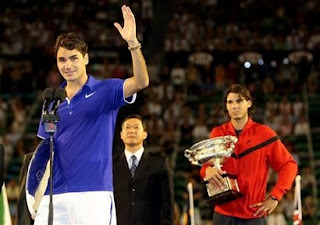 I just realized: I never said goodbye to this year's Australian Open. I mean, there were champions I haven't acknowledged, tears I haven't made mention of … the whole kit and kaboodle! I'll keep it brief since everything's been discussed and dissected elsewhere. • First, congrats to Rafael Nadal on winning the whole thing. Is it me or do you, too, like him more each time you see him win? • I'd also like to acknowledge the Bryans and Mahesh Bhupathi and Sania Mirza winning the men's and mixed doubles, respectively. I always plug this all the time I write something about the Bryans, and sadly, I'm going to do it again. I just think they should get more props for what they've accomplished. • What can you say about Serena Williams that hasn't been said? Wow. • Roger Federer's going to be OK.
• My favorite performers this tournament? That has to be Fernando Verdasco, Jelena Dokic Andy Roddick. I hope they keep up the good form throughout the year. • Also, that was some run by the Russian women, huh? They were a missed volley away from their being four in the semis. Well, anyway, I'm moving on. But you have to admit (or at least I am! ): This was one of the most intriguing Aussies in years. I just want to say, though, before I turn it in that despite the epic match he played with Fernando Verdasco which seemed to last about a day, I'm still going with Rafael Nadal to win. I just have this gut feeling about it. Of course, my gut's been wrong many a time, so don't run out and place any bets on this! Anyway, I think it's going to be Rafa in four over Roger Federer. These young whipper-snappers like Nadal can play all day every day. I don't think fatigue will be too much of a factor. It should be a pretty good one to see, even though I guess I'm going to have to catch the replay!